Downtown Phoenix, a stretch from Turf Paradise, at the Arizona Center is this feedbag wanna-be. Don’t get fooled by the location or atmosphere. I did. We were asked immediately by the hostess if there were only two of us and we acknowledged her question. “We’re going to sit in the bar,” we said but in a couple of steps she called us back. “Here are your menus,” she said as we returned and took them from her outstretched hand hovering over the podium. We sat in the stylish bar at the eclectic hightop seating area my back to the bar and scoured over the nicely written menu for lunch. A sign? I like signs even if they’re bad. I looked at my watch and noticed it was 11:30, the same as the name of the place. Lucky or not, here I come. Becky nodded yet the theory of cooked eggs remained scrambled in her head. Then from my back in silence the bartender arrived. I looked down to see if he was floating. A nicely dressed unsmiling young man asked for our drink choices and left, returning in only minutes. “You ready to order?” he asked through the grimace. The food arrived. Uh oh. I should have read the menu more clearly. It was clear. ‘Roast beef thinly sliced on a toasted hoagie bun with Jack cheese, dipping sauce and fries’. In the un-learnable 1130 language this translates into, ‘Canned beef sliced thinner than Saran Wrap on a rectangular over-toasted, cleanly separated store bought hot dog bun with a minuscule amount of flavorless Jack cheese, canned au jus and ten french fries. We supply the Catsup in the original Heinz bottle with a splem-covered neck with a cemented cap that I had to hit with a knife to loosen it. You ever wonder why the picture never looks like the real meal. Again, it doesn’t look like the picture below the 1130 webmaster posted on the web. 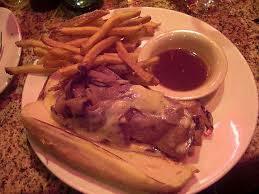 Not even close and this one shows a whopping 15 fries and a two spoonfuls of the salt-based au jus. Her salad on the other hand looked great. That’s why she left over half and only ate the chicken and the egg. They must be able to do hard boiled eggs. Breakfast? No, I don’t think so. We left unsatisfied and as I drove away, I wondered how we were to ever get back the time we spent there eating although the conversation was worth it. I looked in the rear view. I wasn’t smiling. A vision of the bartender’s mirage reflected in the mirror. I’ve become just like the bartender at 1130, I thought. There’s a horse loose somewhere in here! When The WiseGuy loaded the ponies in the starting gate, the post positions came out like this in the program of eats. Here’s how they line up in the gate, with number one on the rail being the favorite.